Caroline really loves fitness as a whole and being active every day. She’s an ex-CrossFit athlete who still loves to toss heavy weights around with some good ol’ fashioned cardio. Otherwise, you can usually find her home with her daughter Grace and partner, Chelsea. Caroline religiously practiced Bikram yoga when she lived in the D.C. area. 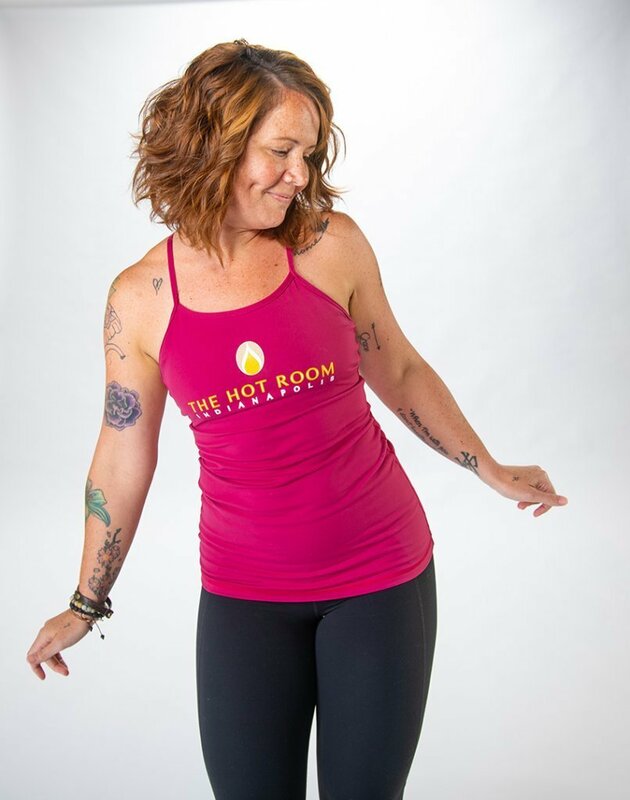 She moved back to Indianapolis and kept her practice going by joining The Hot Room. Caroline realized teaching this modality was her calling. This yoga helped Caroline through some difficult times and helped her find her strength. She believes in paying it forward, in being a good and humble human being, with compassion and gratitude. All of my students will tell you it’s half-tortoise. I love that posture for its ability to provide strength and renewed energy. Often times in class, we hit the floor series and our tank is running on empty right about the time we hit half-tortoise. I truly believe if you give into that posture, letting yourself go, while holding strong, active arms and stretching your hips back to your heels, you will find a burst of energy. My goal is always finish class as strongly as I started, I believe in the power and purpose of that posture to help me achieve that. I’m obsessed with elephants. I collect them and people who know me always gift me with elephant trinkets of some sort, it makes my heart so happy every time I get a new one. The elephant tattoo on my right arm is a representation of the matriarch of my family, my grandmother. When she passed, I got this tattoo in honor of her. The matriarch elephants of herds are always female, the oldest and largest. That represented everything my grandmother was.